With Liverpool not in action until Monday (away to West Ham), Man City and Tottenham closed in on the leaders thanks to victories in their respective fixtures this past weekend. 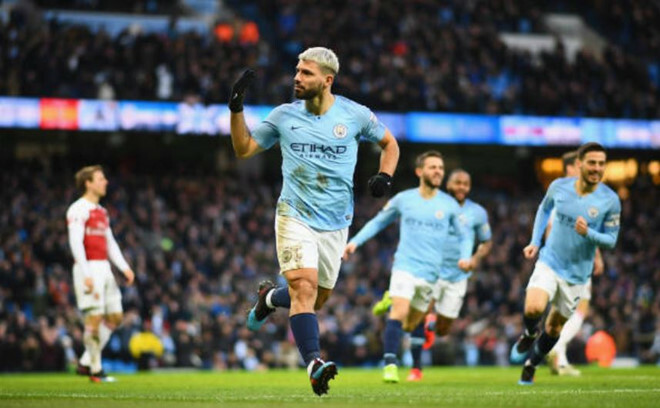 City cruised past Arsenal 3-1 with Sergio Aguero scoring a treble while Son Heung-Min was the hero as Spurs edged Newcastle 1-0 on Saturday. The results mean that City and Spurs are now two and four points behind Liverpool on the table. Chelsea produced the biggest scoreline of the weekend, cruising past Huddersfield Town 5-0 at Stamford Bridge. A brace each by Gonzalo Higuien and Edin Hazard put Chelsea on their way before David Luiz put the icing on the cake with a fifth. For Man United, they continued their fine start to life under Ole Gunner Solksjaer with a 1-0 victory away to Leicester City. Marcus Rashford scored the only goal of the game inside the first 10 minutes at King Power Stadium. United have now won 8 and drawn one of their 9 games ever since Jose Mourinho was shown the back door. Wolves were the other big winners on the weekend, defeating Everton 3-1 at Goodison Park. Ruben Neves, Raul Jimenez and Leander Dendoncker were all on target for Wolves while Andre Gomez scored Everton’s consolation. In the Bottom half, only Crystal Palace and Cardiff City registered victories. Luka Milivojevic and Jeffrey Schulop scored Palace’s goals in a 2-0 victory over Fulham while Bobby Reid scored a brace as Cardiff overcame Bournemouth by the same scoreline. Here are the eleven players that stood out for me this past weekend in a 4:3:3 formation. GK: David De Gea (Man United). It was a tough choice leaving out Watford’s Ben Forster but i had to go for De Gea. Arguably the best goalkeeper in the world at the moment and he keeps justifying the tag. Against Leicester on Sunday, the Spaniard made six saves including a magnificent one to keep out Rashid Gazhel’s free-kick as United won 1-0. One of the stand out performer in the Premier League this season. Doherty was at it again on Saturday as he created several chances for Wolves in the 3-1 win away to Everton and also won the penalty that Ruben Neves converted for 1-0. The Brazilian defender completed 93% of his passes against Huddersfield, while also making four tackles and two clearances. He also scored the 5th goal in the 5-0 victory. Sol Bamba was as inspired as anyone in a blue shirt against a dangerous Bournemouth. Only James Tarkowski (36) and Ben Mee (31) have made more blocks than Sol Bamba (26) among centre-backs in the Premier League this season. LB: Aymeric Laporte (Man City). At first he looked to be over priced when City signed him from Bilbao but he is currently amongst the best defenders in the League. Against Arsenal on Sunday, Laporte played at left-back, setting up Aguero for the opener. The 3-1 win against Arsenal only underlined further, how important Fernandinho is to City. He started at center back but spent most of his time playing in midfield. The pass out wide to Sane in the build up to City’s second summed up an incredible performance for the Brazilian on the day. Kante provided two assists in Chelsea’s 5-0 win over Huddersfield, with both of those coming for Gonzalo Higuaín. MF: Bobby Reid (Cardiff City). Scored Cardiff’s two goals in the 2-0 win over Bournemouth on Saturday. Eden Hazard registered his 200th and 201st goal involvements in his top-flight league career (117 goals, 84 assists), with 130 of those coming at Chelsea. Both his involvements were goals scored in the 5-0 win over Huddersfield Town. The Argentine striker scored with both of his shots on target against Huddersfield (six shots, two on target).